Oprah’s Life You Want Weekend this past Friday and Saturday was already shaping up to be an amazing experience for me months ago. I floated the idea to my client-turned-friend Mark Nepo that I’d love to fly up to Seattle see him on tour. I don’t even know what possessed me to ask him for a ticket, but I did. Never in my wildest dreams did I imagine that request would turn into a VIP ticket, which turned into a VIP ticket with a town car picking me up and dropping me off from the airport, which turned into a VIP ticket, town car, and comped hotel, which turned into not one but TWO tickets (that included MEETING OPRAH! ), which is how my wife and I ended up sitting in Row 3 (right across from Arianna Huffington and Gayle King), and ultimately hanging out with the rest of the trailblazers (and yes, Elizabeth Gilbert, author of Eat, Pray, Love, was undoubtedly the one I was most excited to meet). Sitting in Row 3 felt a lot like sitting on a movie set. Even on the few occasions I’ve seen shows in New York and San Francisco, I’ve never had great seats. If you’ve ever sprung for great seats (or had them comped), you know what it’s like. When Oprah stood on the edge of the stage that first night she was RIGHT there. The women in the first row were shaking. When Oprah addressed the woman sitting in front of me, she had to fan herself to keep from passing out. Oprah’s weekend tour is an eight-city extravaganza, and Seattle was the second to last stop. Our audience was small by comparison to other cities—only 10,000—and, from what I was told, very white. Like all the audiences, however, it was 98% women. When Iyanla Vanzant asked all the men in the audience to stand at one point, I did a quick estimation: about 50 guys. She promised them not to rat them out to their friends. Oprah kicked the whole thing off on Friday night, and from 7 – 9 pm we were treated to the best of Oprah. Dressed in a gorgeous purple gown, she was radiant. She talked about her history, and shared details so intimate that it was almost easy to forget that there were 9,950 people sitting behind me. She set the tone for the weekend, speaking of how she’d dreamed a bigger dream for herself, from a young age, than what was expected from her as a young “colored girl” from Mississippi. Her grandmother told her the best she could hope to do for herself when she got older was to find “good white folks” to work for, and the whole audience laughed, as I imagine they did in every other city, no matter the demographics, when she said she did find some “good white folks”—to work for her. We went back to our hotel happy, and we slept well. We’d had an evening with the queen, and we were going to meet her the next day—and we had a bag full of swag on our shoulders, and a tea box set that Oprah urged us to try in the morning. “Get chai’ed up,” she said. I didn’t make any promises. I need my coffee in the morning. Saturday morning opened with Mark Nepo and a waking meditation. Mark is so profound and eloquent that you wish you could pause and rewind him as he talks. He was his usual magnificent self. The story that stood out for me was a tale about what Buddha once said when asked how rare human birth was. The Buddha’s response was a story of a sea turtle that breaks the surface of the ocean and looks around. The turtle then goes to the sea floor and sleeps. When he wakes up, he rises to the surface again. The likelihood of that turtle breaking the surface that second time coming up in the same exact spot is how rare human birth is, Buddha explained. We were left to contemplate the incredible and mysterious fact of our existence. I contemplated the number of stressed-out days I have in a week and tried to grasp onto some shred of feeling special and unique, which is not an easy thing to do in an audience of 10,000. But Mark had certainly set the tone. 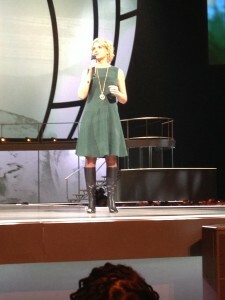 Liz Gilbert was up next, in a sleeveless, knee-length, emerald green dress and leather boots. She spoke of the hero’s journey, and how, for millennia, women have not had a place in this journey. There is no long tradition of the heroine’s journey. She spoke passionately for women, urging us to reimagine ourselves, to hold ourselves precious enough not to capitulate to that which is expected of us by society. It was an overtly feminist message for overwhelmingly female audience, and it f-ing rocked. Liz is a champion of women, the best kind of sister in arms—one with a mission and power and presence and a stage. I’m totally converted; I’m a true fan. Rob Bell took the stage next. And I thought Liz was animated…. This is a guy who, were he not a pastor, probably could have had a career in interpretive dance. He is long and lean and lurched around the stage with long steps and sprightly jumps. He said, “Are you with me?” a lot. The energy build-up was palpable. Rob spoke of the journey of the breath—urging us to think of the first and last human breath by telling about the birth of his daughter and the death of his grandmother. He took Mark’s point about the rarity of being human to a whole new stratosphere, and when he spoke of JUST. HOW. INCREDIBLE. human life really is, I felt less compelled to think about how lame I am for never seeing it that way and more in love with my neighbors in the arena, amazed at my own life, having been giving life, having given life. Then it was lunch—our chance to meet OOOHHH-PRAHHHH! The VIP lounge was packed with 150 of our new friends, clearly feeling that their investment in the $1000 ticket was about to be satisfied. We were served a lunch of couscous, Caesar salad, and sliders (not bad at all). There was also wine and Moscow mules. After about a half-hour, Oprah came up in the service elevator. She was wearing purple on Saturday too. She laid out how the photo shoot was going to work—receiving line style—and managed to be seriously charming when she joked that now was NOT the time to tell her our life stories. We had instructions (which I later ignored) to say “Yay!” when we shot the photo, so that we “looked like we were best friends.” Yes, she said that, and I think we pretty much look like we’re best friends so it was perfect for me. My wife and I got hip to the line forming in the VIP lounge as soon as we saw it, so we were maybe the twelfth and thirteenth people to get our photos taken. We were anxious to get out of the crowded lounge and back to our floor seats to listen (and dance) to Michael Jackson, Whitney Houston, Earth, Wind & Fire, and Stevie Wonder remixes being spun by DJKiss onstage. After lunch we did Soul Cycle, and it would have felt fantastic if I hadn’t been wearing a cashmere sweater and high-heeled boots. Then we were treated to Iyanla Vazant who was—to put it mildly—off the charts. She simulated child labor on stage, and punctuated her points by screaming, literally. Her time on stage was a performance, complete with a champagne flute prop she used to toast Life at every opportunity. Life was the subject of her talk. Life, she told us, wants you to succeed. She (yes, she is most definitely a woman) is on our side. She will not stab you in the back, or try to mess you up for no reason, which other people will most definitely do—and have done a lot to Iyanla. In addition to talking A LOT about shopping, she also spoke of forgiveness, and that we have to forgive ourselves in order to forgive others. Iyanla’s was not the kind of talk a person walks away from feeling like they’ve been showered with ahas, but it was fun, and often funny, and she did end the event with a bang. 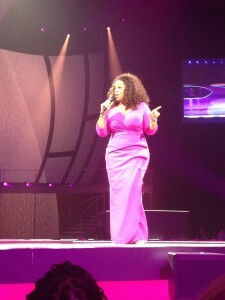 Oprah took the stage again after that to remind us that we are the masters of our own destiny. There were more inspiring stories. 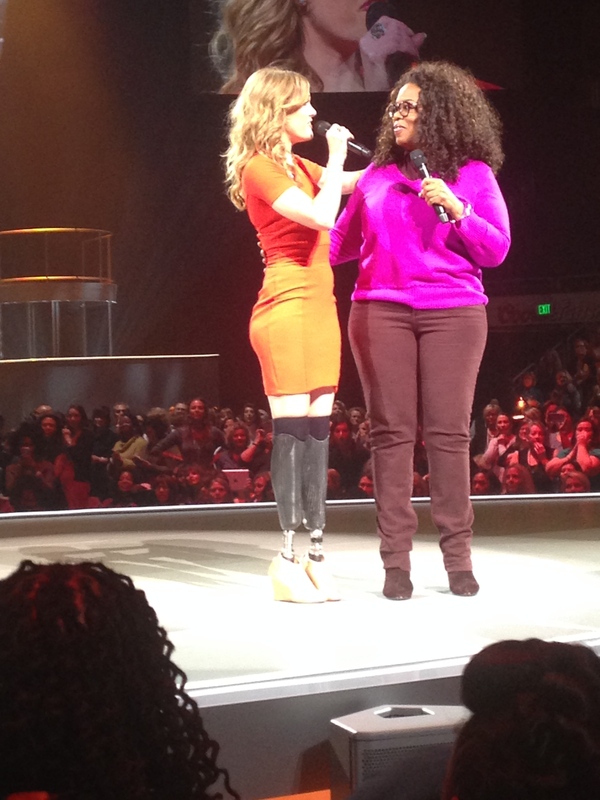 We met Amy Purdy, who came out on stage wearing two prosthetics with wooden clog feet, and a short, bright orange dress. She was cute and articulate and inspiring (and there representing a sponsor, Toyota). Oprah said, more than twice, how amazing Amy is, and she really is. 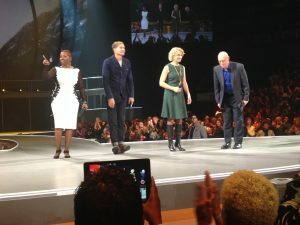 Oprah brought people from the audience up on stage throughout the weekend to share their stories, their insights, or just to give big Oprah hugs. She always shines, but in these moments she’s like the sun—so at ease showing people the magnificence of another human being. When in Oprah’s presence, people are their best selves. It’s like she has a radar for the best qualities in people, and you see this spark in a person—through Oprah’s eyes—that you might otherwise pass on the street without even giving a second look. For me the power of the weekend was the connection. This was about the Life You Really Want. And while it definitely veered much more into consumerism than I would have liked—there was a lot of swag, which is expected from Oprah, but kind of overkill; O-Town was this outdoor, tented mall area that was basically one big commercial, only worse because people were standing in lines to subject themselves to makeovers, getting their photo taken to be plastered on a fake O! magazine cover, loading up on free junk from IKEA and other sponsors—it was still incredible. I felt engaged and alive and inspired the whole weekend. I’m not sure how I would have felt if I’d spent $2,000 for our two tickets, but the people around us who did seemed legitimately stoked. 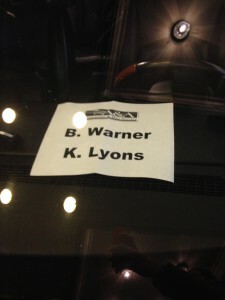 I realize my experience was a little more VIP than most, and getting to actually hang out with the trailblazers on Saturday night after the event sent me into temporary star-struck frenzy that I was able to snap out of by the time we got to dinner. But yeah, I’m not gonna lie, it was more than cool. When the town car came for us on Sunday morning, I snapped a shot of our names on the printout sitting on the dashboard, because I’m pretty sure we will never ever travel in this kind of style again. For this short weekend, we got a taste of the VIP life. But I didn’t leave feeling like that’s the “Life I Want.” When I visualized my life in ten years, it was in my house, with my wife, with healthy kids and doing the job I have now. I’d like a little more space, and more time to work out, but really, I have the life I want already. My takeaway and gift to myself, if I can stay present enough to remember to do it, is to honor and be grateful for what I already have. low-down. I’d love it if you want to share your own insights and stories. 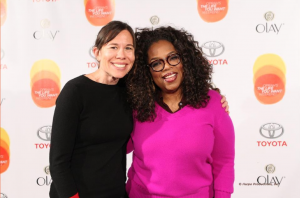 I know that tons of She Writers have met and been onstage with Oprah, and it’s been fun to hear all the one-degree-of-separation stories on Facebook, which is where I’ve been hovering with Oprah for about 15 years. 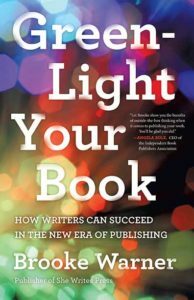 Previous PostWhen Should You Change Your Book for an Agent or Editor? I loved reading this, having attended Oprah’s 8th and final event last week in San Jose. We had Deepak leading the meditation and that was truly a highlight– hearing the silence of ten thousand (mostly) women meditating. It was fun to revisit the rest of the experience through your eyes–Liz Gilbert’s hero journey, the same Soul Cycle, Iyanla. I, too, shrank from the long commercial that was O Town. Glad you enjoyed the VIP status, and took us along, too!